I wanted to use xml with the google maps api rather than kml data as kml will not show mp3 or video other than youtube on Google Maps. I want to automate the xml production as much as possible. 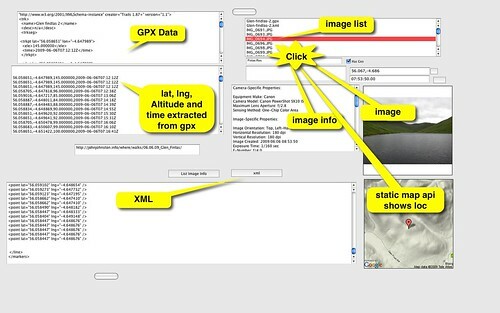 I started using GPSphotolinker to add geo data to photo exif data and SuperCard to pull that information and create the xml, I am trying to reduce the steps and use SuperCard and commandline tools, accessed from Supercard rather than a set of separate applications. Use Trails iphone app to record path when walking. Trails is a very nice app indeed. Trails records points along the way, it also allow you to see where you have been and displays this on a map. As I often walk in places that do not have good mobile reception I use the cache feature which allows you to download and cache map files. Trails displays useful information about total distance and spped covered too. Trails allows you to add waypoints as well as recording a line. At the moment I am just using the line feature. Take a pile of photos, record audio and video on walk. Email gpx and kml from Trails to myself. 56.058651,-4.647989,145.000000,2009-06-06T07:12:12Z It is faster than xml parsing but will break if the format of the trkpt changes. This list can be used with SuperCard's merge function to produce the points we want. To create markers we need to know where the photos were taken. The simplest way is to use something that geotags the photos from the gpx file and a nice way to d othat without leaving SuperCard is to use the exiftool commandline application which does just that. It have been very accurate in my tests. I then build a list of information for each photo getting the newly added location with another commandline tool exiftags (I could use exiftool for this, but started with exiftags) which gets the time taken too, i add titles and descriptions and build a list of the information. This is sorted in SC so that the markers are in chronological order which means I can link the bubbles on the map in order. After sorting it is easy to merge each line of information to produce the xml. You need to provide the full url to the images in the xml (I think) so I put the intended path in to the mix too.